Within the realm of Public Relations, there are many types of digital content that get created and often promoted. Content that can be searched on can be optimized, and that spells opportunity for extending the reach of PR and media relations efforts. Journalists and consumers alike are searching, why not make sure the content published to the web as part of PR efforts is easy to find via search? The opportunity to optimize PR generated content extends beyond text to digital assets ranging from audio, to images to video. 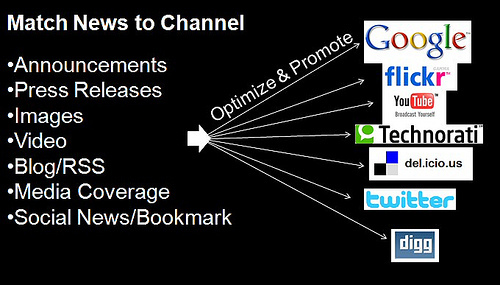 Digital assets can be optimized and promoted for purposes outside of PR, with benefits such as link building for SEO. Managing the implementation of Search Engine Optimization principles with content created by PR firms or internal PR staff involves the creation and maintenance of keyword glossaries from which to pick phrases for optimization as well as best practices applied to content creation processs. We’ll cover the business of picking the best keywords and creating a keyword glossary in an upcoming post. Establishing search analytics reporting mechanisms to gauage effectiveness of SEO efforts as well as to provide feedback is as essential as is ongoing training to stay current with SEO tactics. Measuring the effectiveness of optimizing PR based content is also a topic we’ll cover in this series. The bottom line for PR professionals that want to take advantage of SEO tactics to extend the reach and visibility of content via search, is to take inventory of the content being published digitally – in all formats. 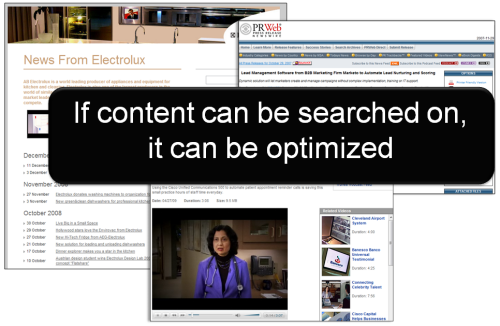 Include keyword optimization in content planning, creation and publishing. Make it part of the company PR content creation and promotion process. Need more info on PR tactics that affect search engine optimization and vice versa? Check out this Using news to drive SEO post. This post is #2 in a series of ten, “Top Ten SEO Tactics for PR Professionals“. Read on for the next post which covers, “When is PPC better than SEO for PR?“. Optimizing PR based content is something companies must look into as a long term tactic but sadly only ultra serious businesses stay in touch with industry best practices such as these. In India, web PR is just beginning to take shape so expecting advanced tactics like optimizing PR based content is too much right now. Maybe in near future we can expect something exciting. That’s to say “do everything you can to promote your business”. PR releases/announcements are one optimization which can add very good value to SEO and unfortunately it is highly ignored. Hallelujah! I’ve been banging on about this for ages. If you want to be effective at PR you need to learn the principals of SEO. If you don’t, you’re simply not doing the best job you can for your clients. Nice post, all great “outside of the box” ideas. What would you recommend when doing SEO for a client that just has a simple website and no other content to do these kinds of things? I think social media is something that if a business is not doing right now then they are FAR behind the game. One thing that does interest me and I think someone already touched on the topic in the comments is that you rarely see press releases optimized for SEO. For instance if you are trying to rank for a keyword then you should hyperlink the keyword with the target URL in the release so when it gets syndicated and picked up it will be prominent on strong PR and trusted websites. Brennan, regarding it being “behind the game” for companies not currently engaged with social media programs, I’d say yes and no. It’s never too late for a company to start better communicating with it’s customers and prospects. Social media is simply technology that facilitates word of mouth. Getting started with social media efforts is simply reaching out and getting involved with conversations that are already happening. It’s never to late to start listening to customers and providing more value. True enough, whenever you are in an online business, put in mind that there are a lot of ways to promote it, not only through online SEO but offline as well. Personally, I find press releases quite effective. This post relates well to the saying that performing a business-in-a-box won’t lead you to sucess.